If you live in the snow zone or an area with colder winter climates, you know how challenging winter riding can become. 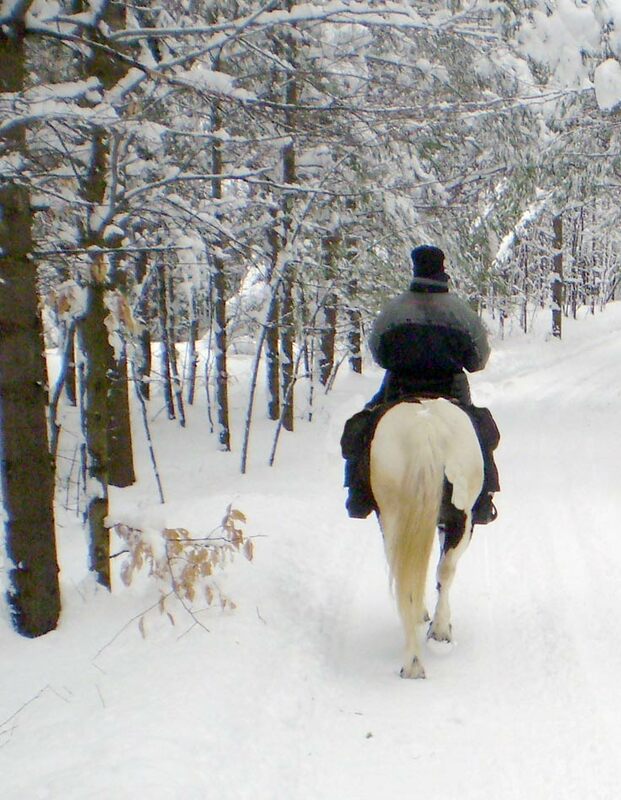 Here are a few winter horseback riding tips befor taking the taking the plunge. 1. Dress in layers. Wear a light weight under layer like thermal underwear or Under Armor then add a middle layer of wool, or a synthetic that insulates like Thinsulate without adding a lot of bulk and extra weight. Finish that off with a good winter jacket. 2. On the trail, pack a small waterproof container or even just a Ziplock bag that has at least matches or a way of starting a fire and something that provides an extra layer of warmth like a space blanket. REI and boating supply companies have small emergency kits that are waterproof that can be thrown into a saddlebag or fanny pack. 3. When tacking up, check your horse’s hooves for snow or ice if he’s lives outdoors. You can also spray the hooves with cooking spray or a coat of Vaseline to keep snow and ice from packing into his feet. 4. Warm up. Start out slow at just a walk for a mile or so to warm up your horse. In snowy and icy conditions keep in mind that you should never ride as fast as good weather conditions. You want to avoid slips and falls of any kind. 5. Always take extra time to cool your horse down after a ride. Never trot or lope your horse back to the barn. If your horse was ridden hard enough to break a sweat, walk in the last 1 to 2 miles. Consider blanketing your horse for a few hours after a ride even if you usually don’t blanket. 6. If you are going to wear insulated boots check to make sure that they are easily removed from the stirrups. You can get a set of ‘overshoe stirrups’ that are built over sized for just this purpose. 7. Hydrate on longer rides. A lot of people either forget or just don’t know how easily it is to get de-hydrated in the winter when outdoors. Bring along water in a Camelbak or other suitable water system. Dehydration can make it easier to get hypothermia or frostbite. 8. Water is also important for your horse. Studies show that when they’re offered warm water they will drink than if their water is ice cold. Horse’s that don’t drink enough water are at an increased risk of getting colic. 9. Choose smaller goals for winter riding. If you normally go for 15 mile rides in the summer, maybe cut that back to 9 or 10 miles in the winter. 10. Choose riding areas with better footing. We usually stay on jeep roads in the winter and leave the off road riding for the summer. With a little planning you and your horse can still enjoy getting out in the winter.